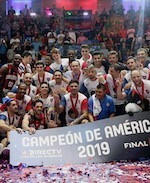 San Lorenzo cruised past Fuerza Regia in the semifinal stage opener. Marcos Mata (201-SF-86) came up with 24 points and 9 boards for the Argentinean powerhouse. Fuerza Regia jumped to a 24:21 lead after the first period. But San Lorenzo held their opponents to just 8 points in the second term to surge ahead. San Lorenzo unloaded 48 points in the second half and cruised to the win. Javier Justiz (205-C-92, agency: Pro Sports) delivered 12 points for San Lorenzo. Denis Clemente (183-PG-86, college: Kansas St.) tossed in 13 points for Fuerza Regia. Mogi das Cruzes overcame Ferrocarril to open win count in Group E. Shamell Stallworth (195-SG-80, college: USF, agency: Interperformances) produced 18 points to lead the Brazilian team. Mogi das Cruzes recorded a 41:33 halftime advantage. They used a 19:17 run in the third term to clear off for good. Larry Taylor (185-PG-80, college: Missouri Western) accounted for 17 points in the win. Franco Balbi (185-PG-89) and Mauro Cosolito (195-SF-88) answered with 19 points each for Ferrocarril.